"Remember, this is the south where simplicity is the secret to most recipes. Follow this to the 'T' and you will have sweet tea, Sand Lapper (South Carolina) style." Using an electric coffee maker, Place the 3 tea bags in the strainer basket (not in the pot). Brew the tea as you would coffee. Pour the sugar in a gallon pitcher. Pour in the hot tea. Continue to run coffee maker with the tea bags until you have enough tea to fill the pitcher. Allow to cool completely at room temperature, then refrigerate. This recipe is as close as I have come to the sweet tea I love in certain restaurants. I make it often!! I love this!! Tastes just like the restaurant ones and I will make it this way from now on! Thanks, Deanna!!! Wow I didn't realize making great iced tea could be this easy! Now I can make it often. I will probably cut down on the sugar though, although it did taste wonderfully sweet! Thanks Deanna. 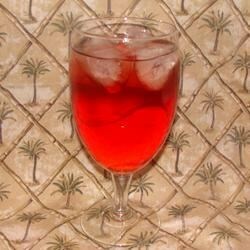 I have been looking for a sweet tea recipe that resembles the tea that is served in kentucky. This is as close as I've come. I liked this tea! Good Job!